Links in the shop section are from affiliates and sponsors. This blog may earn a small referral commission from the retailer, at no cost to the purchaser, if a qualified sale is made. This is our hand-picked selection of collection of pretty pink dresses for wedding guests to wear to weddings. 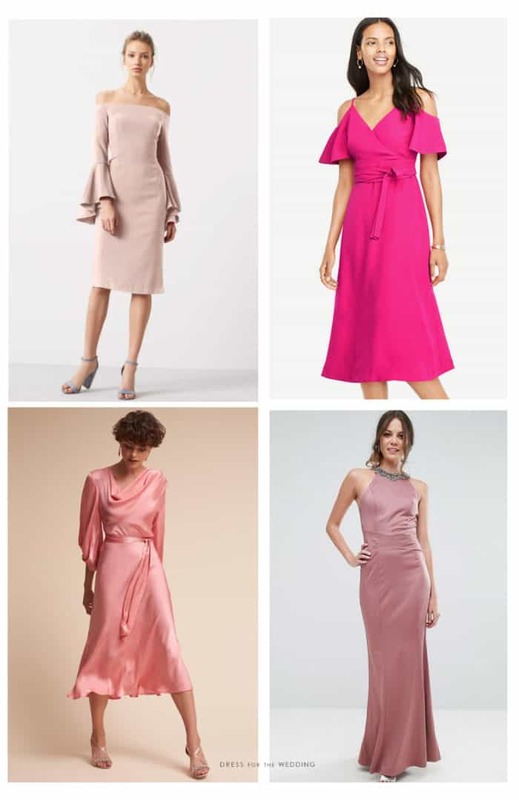 If you’re in the wedding and looking looking for pink mother-of-the-bride gowns or pink bridesmaid dresses please also check out those shop pages! Pink dresses are a beautiful color to wear to weddings! When picking the perfect pink dress or gown, just be cautious of pale blush pink, since many wedding dresses are that color. Instead, a deep pink, rose, mauve, or coral is a great choice. While a pink is always a favorite choice for summer, deep pinks and rose colors are even great for fall and winter weddings. This is our current selection of pink dresses to wear to a wedding or to a rehearsal dinner or bridal shower!